We are on the final three in our countdown of the Top 10 Customer Complaints of 2012! To catch up on all the great posts in this countdown thus far, view our previous entries here: #10, #9, #8, #7, #6, #5, and #4! We did not expect this complaint to rank this high. Maybe it’s a sign that customers are extra conscious about value for money. In any case, this is a tough complaint to deal with because evaluating portion sizes is often subjective; what may be more than enough for the 120lb college student may not even make a dent for a 250lb football player. However, what most customers expect are average, reasonable portions. The type of restaurant also factors in to this. Generally speaking if you’re a large chain restaurant, the expectations will typically be for larger portions. Conversely if you’re a boutique French bistro, customers may expect smaller portion sizes (but with higher quality ingredients). Regardless of what kind of establishment your run, ultimately, the most important aspects of portions sizes are consistency and transparency. After examining the 2012 feedback, consistency is something returning customers expect and notice, especially if you raise prices. It is also imperative for your operations. To keep costs in check, your portion sizes and ingredients that go into every dish must stay the same or you will lose control of costs and have lots of waste. An ounce of cheese extra every day, a slightly larger slice of chicken – it all adds up. Transparency about portion size is also important. 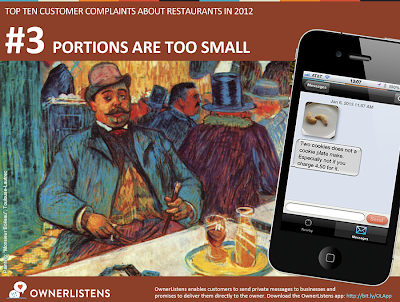 Analysis of 2012 feedback reveals that the portion size complaint often manifests in the form disappointment at either the number of items of a particularly coveted ingredient, or the size of an extra item ordered. Let’s first consider coveted ingredients. If your menu, for example, features a “shrimp salad” but there are only two small pieces of shrimp, you customers may ultimately feel cheated. In 2012 feedback, we see recurring complaints about shrimp, chicken, avocado, and asparagus – great examples of coveted ingredients that tend to be expensive. Next, let’s consider disappointments with side orders and extras. If you, for example, charge $5 for adding avocado to a salad and serve only three thin wedges, there is a reasonable chance your customers will be disappointed. It is likely no surprise that pricing influences this sentiment with side orders considerably. In this example if you instead only charged $3 for the side of avocado, the customer may feel like the cost is appropriate. The important thing is that the price sets an expectation you should be aware of. It’s important is to let the customer know what to expect so they can make up their own mind about whether the item is worth it to them. So what should you do about portion sizes in your restaurant? Take time to review each menu item and define portion sizes for you and for your staff. This may feel tedious but you only have to do it once. Get your recipes down to the most accurate level possible. Make sure preparation instructions include the amount of each ingredient and make it easy for the kitchen staff to follow (pictorial recipes with large print on ingredient sizes might help). Make sure you have measurement instruments available and right sized cooking equipment, pre-cut whatever you can (without losing quality) to the required size. Ultimately, every time a certain dish is ordered, it should have a consistent size and look, regardless of who prepared it. By being consistent, you can manage customer expectations and avoid portion size complaints at your establishment. We recommend you can inspect this regularly over time and correct where necessary (tip: take a photo of the same dish throughout the day or week and then compare). For problem items like those mentioned above, it’s good practice to train your waiters to mention the size or the number of extra items the customer should expect. Some places may find it beneficial to note this information directly on the menu should that communication method fit the establishment. However where possible, it’s ideal if waiters converse with customers and can communicate this information. Such a two-way exchange facilitates commitment on both sides and results in better service (and in better tips). And of course, solicit feedback from customers to understand how they feel about your portion sizes. If they’re too small, you can be sure customers will let you know with OwnerListens. If you haven’t done so already, sign up for OwnerListens now. Owners – Have great techniques or strategies you employ at your business to provide consistent portion sizes? Share them here in the comments section! Consumers – If you find yourself feeling like your portion size is too small, let the owner help before you yelp by using the OwnerListens app!